Our Animals - Welcome to Lamppost Farm! Lamppost Farm employs a dedicated workforce including cattle, pigs, chickens, turkeys, dogs, sheep and even a llama! Our animals work to regenerate the soil simply by being the animals that God has created them to be. On the farm, cows eat, chew their cud, and spread their manure. The landscape management that is going on is re-claiming fields and building soil. In old corn or soybean fields, chickens move daily in their field pens to forage for grasses and gobble up bugs. They leave behind a layer of manure that within a year has caused native grasses to grow, enriched the soil, and improved the pasture for future grazing. 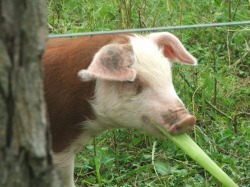 We employ pigs (nature's rototillers!) to assist the management as well as help in turning animal bedding into compost. A cross of Berkshire and Hereford lines, Lamppost Farm pork is the some of the best in the business. These pigs spend happy days running around our pasture, foraging for acorns, munching on our food scraps, and snuggling up when it gets chilly. Another employee is the Devon breed of beef cattle. 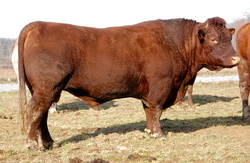 Having arrived at Lamppost Farm in 2010, the Devon breed is called the "best beef in the grass business." Cows eat a significant amount of grass and weeds yet only turn 20% of it into usable nutrients. 80% is turned back into the soil in their manure. This is great for renewal due to the presence of new microbes that are left behind. And also, their ability to eat grass and turn it into high quality marbled meat is second to none. We won't need to feed our cattle grain because the Devon finish very well on grass like they were designed to do! Each animal on the farm makes multiple contributions (even the cat). 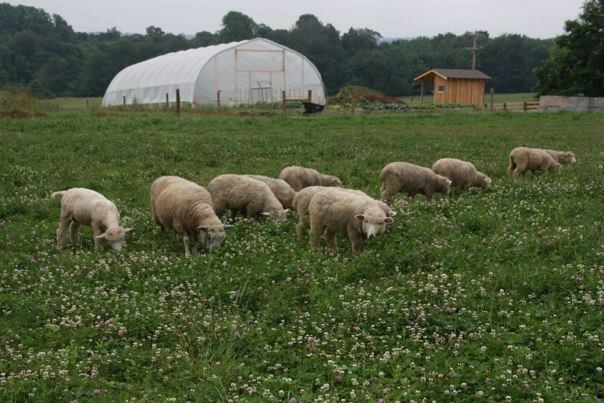 Pastured chickens and pastured pigs, as well as grass-fed beef provide nutrients, cancer fighting acids, and healthy fats that conventionally raised animals do not.